In case of anything untoward happening to me, I desire to turn over all my books in Peking and in Shanghai at 1843 Huai Hai Lu, to Ernest Tang (邓广殷同志) as rememberance for all his kindness to me. Who is Ernest Tang? Why did Soong Ching Ling desire to turn over all her books to him? We’ll talk about it from his father M.C. Tang. Mr. M.C. Tang was a close comrade in arm of Soong Ching Ling. In 1938, Soong Ching Ling founded the China Defense League (CDL) in Hong Kong and M.C. Tang, then Vice General Manager of the Sino-Belgium Bank in Hong Kong, became a member of central committee of CDL and a financer in charge of financial work in CDL. He took advantage of Sino- Belgium Bank for CDL to conduct its fund raising work abroad. His “Red House” situated on the hill in Wan Zhai was used as a gathering place for CDL and other anti-japanese aggressor’s organizations. Besides, he gave away all he had to fully support the national salvation movements. Publication and Issuing of the Newspaper “China Businness” depended on M. C Tang. At that time the publications of newspapers and magazines were controlled strictly by KMT and the British government in Hong Kong. In 1941, Liao Chengzhi, Director of Eightth Route Army Office in Hong Kong, prepared to publish an objective newspaper according to Zhou Enlai’s instruction. But, it was not easy to find a proper person，who was willing to undertake risks，with social background and rich assets. Warmly supportting Liao Chengzhi, M. C. Tang promised promptly to assume the work. And he persuaded his brother M. T. Tang to take out HK$ 40,000 yuan to open a printing plant to guarantee the publication and issuing of the newspaper. Before the founding of New China, M.C. Tang assisted the underground party in Hong Kong in escorting leaders of Democratic Parties leave Hong Kong secretly for North China. He was appointed Vice governor of Guangdong province in 1955. His friendship with Soong Ching Ling lasted for decades until his death in January 1971. 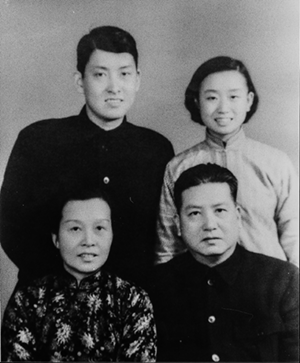 M. C. Tang’s passing away did not interrupt the tie between Tang’s family and Soong Ching Ling. Entrusted by M. C. Tang, Soong Ching Ling reagarded Ernest Tang as her third generation and her relative. In her early letters, Soong Ching Ling wrote, " I have never had the pleasure of meeting you, but through your father who often mentioned you doing this and that for all of us, I feel as if I had known you long ago." This kind of intimate feeling made Soong Ching Ling talk with Ernest Tang freely. In her close to 200 letters to Ernest Tang, she wrote the sickness and sufferings of herself, how she endeared friendship, what she thought about the situation and policies, and displayed her concern and blessing to her friends. Deeply influenced by his father, Ernest Tang hold highest respect and great affection to Soong Ching Ling. Ernest Tang inherited his father's tradition of supplying Soong Ching Ling daily necessities, stationeries, and foreign magazines which could not be obtained in China at that time. Owing to suffering diseases in her late years and be difficult to walk, writing letters to her friends became an important component of her life. Soong Ching Ling's 189 letters to him and his family's members kept by Ernest Tang testified the friendship between Soong Ching Ling and him and displayed Soong Ching Ling's real feeling world. They are very precious and valuable. In her letters to Ernest Tang, she wrote,"Thank you for your comforting message. It helped me a lot. Good friends are so precious when one is feeling down and out." In her mind, Ernest Tang was not only younger generation, but a trustworthy friend. With the mind of appreciation, Soong Ching ling tried to find an appropriate way to repay him for his kindness and care to her over so many years. Ching ling's desire to turn over all her books kept in her residences both in Beijing and Shanghai to him. In her letter dated August 22, 1972，she expressed her initial thought "Anyway, I've prepared my 'Last Testament' and you will receive my library ! Because there are out - of - print classics which I think you will treasure more than anything else and you are fond of reading as I am and value books beyond all else." At the end of 1974, she began to consider how to handle and arrange her heritage. In her letter of December 4, 1974 to Ernest Tang from Beijing residence, she wrote, " Ernest, I haven't such a large collection of books that requires a curator. For the books at Former Residence belong to the government since it was turned over to the government as a national memorial. My own here and those in my Shanghai home, 1843 Huai Hai Lu, amount to several hundred books, so can be packed and sent to you in wooden craters via steamer. Certainly no one can withhold them for they were mine from school days containing modern and ancient classics, or make you keep them here." In early 1975, it was said a big earthquake would occur in Beijing. On Feb.18, 1975, she wrote a letter to Ernest Tang, " I am hastening a few lines to let you know that we have been informed that there will be an earthquake of about 6.0 on the Richter scale, centered in Beijing, between now and end of this month! Everyone is in jitters, as you can well imagine. Some Shanghai friends urged me to return to my home there but that would create more terror among the people here. So I shall remain, come what may. I have written my Testament already. But I want to write a separate one for you to keep." Attached in the letter is above mentioned "Testament". After receiving the testament, Ernest Tang did not leak any information to outside and flew to Swiss where his daughter was studying in the university and locked it in the strongbox of Swiss bank. Late May in 1981, when Soong Ching ling fell unconsciousness, Ernest was instructed to fly to Beijing to see Soong Ching Ling. After Soong Ching Ling passed away, Ernest Tang followed her next of kin keeping vigil on her both sides and later attended the funeral held in Shanghai to pay respect and condolence to Soong Ching Ling. After Soong Ching Ling passed away, the Central Committee of the Chinese Communist Party decided to set up a group of "carrying out the testaments of comrade Soong Ching ling" . In dealing with the testaments, the group learned that Soong Ching Ling had the desire to turn over her books both in Beijing and Shanghai to Ernest Tang. Inquiring his intension by Liao Chengzhi, Ernest Tang expressed his willingness to donate all the books to the state. The ceremony of book donation by Ernest Tang was held at the Great Hall of the People in Beijing in 1976. The Soong Ching Ling's precious books are now kept and managed separately by Former Residences of Soong Ching Ling in Beijing and Shanghai. Being dedicated to publicize the spirit of Soong Ching Ling, Ernest Tang put forward proposals several times to let new generation know, study and carry forward the spirit of Soong Ching Ling. The Shanghai Memorial Residence of Soong Ching Ling has displayed a small portion of Soong Ching Ling's books, which played an important role for visitors to further understanding Soong Ching Ling's spirit and ideal. Today when we visit and study Soong Ching Ling's books, we not only respect Ernest Tang, but we are deeply moved by his lofty deeds. It is his selfless decision that the precious books can be taken good care of and displayed in Soong Ching Ling's Memorial Residence in Shanghai.